Simostronomy: Precursor To An Outburst? 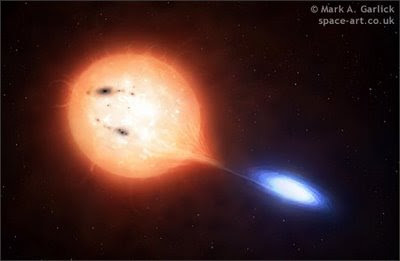 Dwarf novae are compact binaries where one star is a sun-like star and the other member is a white dwarf, orbiting so close that it is literally stripping the outer atmosphere off its partner. The material streams over to the white dwarf but can’t slam down to the surface. Instead, it goes into orbit around the white dwarf, forming what is known as an accretion disk. Image used with permission. Copyright Mark A. Garlick. Do not use this image without permission. Eventually, the accretion disk builds up enough material to become unstable. The disk material falls down onto the surface of the white dwarf, causing a thermonuclear explosion that releases all kinds of energy across the electromagnetic spectrum. Optically, we see these as sudden brightenings of several magnitudes in a matter of hours. These outbursts can last from days to weeks. The system eventually simmers down into quiescence and the whole process starts over again. The majority of these binaries have periods measured in hours. Think about that for a second. Imagine a white dwarf racing around our sun in a few hours, so close it is stripping material from the surface. Everything about these systems is extreme. Some dwarf novae, like SS Cygni, go into outburst every couple weeks. Some may take years or decades to build up enough steam to explode into outburst. No one knows when the next outburst will occur, making these a favorite target for amateur astronomers to monitor on a nightly basis. Occasionally, one of these cataclysmic variables will tip its hand to an upcoming outburst, by becoming active a week or more before the big event. Sometimes they will actually have a minor precursor outburst, fade to quiescence and then go into a major outburst. Over the last couple nights, several UK observers have reported an increase in the quiescent level of V630 Cas. It has been measured peeking its head into the 15th magnitude range, slightly brighter than its normal quiescent magnitude around 16.5V. V630 Cas is rare example of a dwarf nova with a long orbital period. Its period is measured in days, not hours. The last recorded outburst of V630 Cas was in 1992, and lasted about three months from beginning to end. That is a long time for an outburst to last! The only other recorded outburst was in 1950. Obviously, outbursts of this system are very rare, so astronomers will be excited to catch every last detail from beginning to end of the next outburst. This current 'activity' could be the precursor to an upcoming outburst. Observers will be paying close attention to V630 Cas in the coming weeks to make sure that a rare, and possibly long, outburst isn't missed.